Product #21240 | SKU 350963 | 0.0 (no ratings yet) Thanks for your rating! The black 60mm f/2.8 DN Lens for Micro Four Thirds Mount Cameras from Sigma is a prime lens compatible with Olympus and Panasonic Micro Four Thirds mount cameras. With a 120mm focal length equivalent in the 35mm format, this is a mid-range telephoto length lens with numerous applications including portraiture. A maximum aperture of f/2.8 provides shallow depth of field and makes this lens effective in low light. The minimum focus distance on this lens is 50 cm and its maximum magnification ratio is 1:7.2. A newly developed linear auto focus motor provides accurate and quiet focusing which is ideal when shooting video. With Special Low Dispersion (SLD) glass elements and glass moulded aspherical elements, this lens minimises chromatic aberrations for sharp, high resolution images. A seven-bladed diaphragm creates an attractive blur in the out of focus areas. 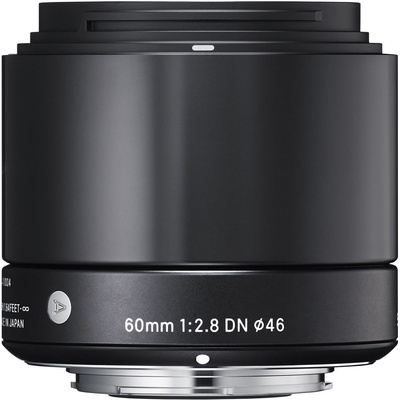 60mm lens for Micro Four Thirds Mount Cameras mirrorless cameras with a 120mm equivalent focal range.